Last month, Chip Taylor, Founder and Director of Monarch Watch, responded to a question related to the potential for monarch migration routes being shut down between Mexico and Texas because of the cold weather, and what this would mean for monarch population growth. The writer understood monarchs arriving early in Texas might not find nectar sources or milkweed on which to lay eggs, which could result in loss of population growth. But why would late arriving monarchs result in similar losses? 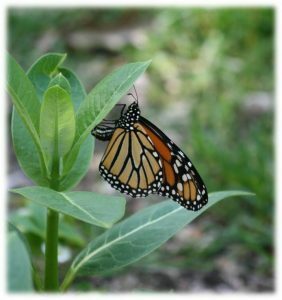 Typically this delayed arrival results in lower population numbers because the overwintering monarchs arriving late in Texas means, generationally, there may not be enough time egg to egg to increase population growth before starting the cycle all over again. Chips response was “late arrivals mean late egg laying that produces a cohort of new adults 30+ days later that is also late relative to those that arrived earlier and matured their offspring earlier. The net effect for the population is to send a first generation north with a higher mean age to first reproduction than if all eggs were laid earlier. This later first generation cohort is likely to arrive later in the North as well as producing more late effects. The overall outcome could be a smaller fall population under some conditions. 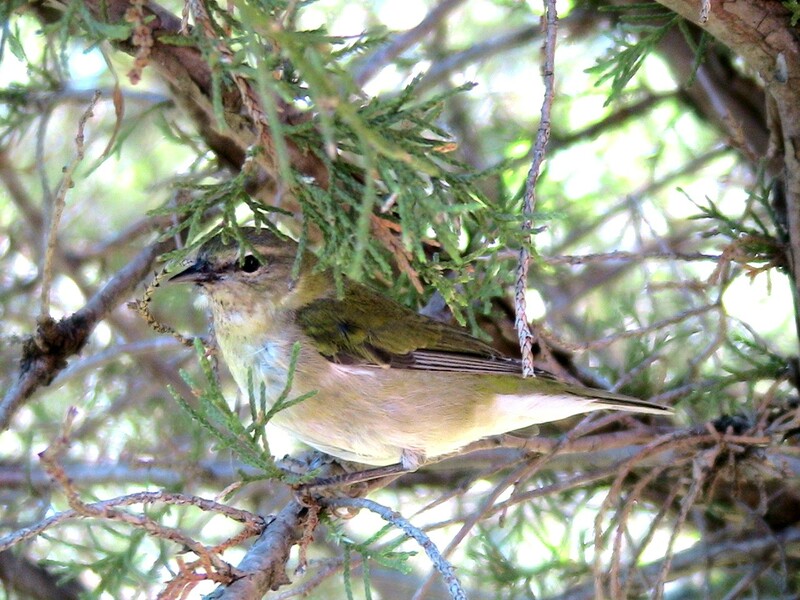 Population growth is all about age to first reproduction – sometimes characterized as generation length. In terms of insects, I think of egg to egg intervals. I want them to be as short as possible if I want a population to grow. Degree days are one way to capture these population characteristics but degree days are not as good as direct observation for a number of reasons. The dynamics of the growth of the population last year – when compared to all previous years – caused me to realize that the temporal and spatial distribution of eggs as well as the quantity laid by returning females – were important determinants of monarch population growth. I’m slow to figure things out. It took me 26 years and lots and lots of First Sightings Data posted to Journey North to figure that out. Note: The cold temperatures did abate last month, and monarchs had favorable conditions along both pathways out of Mexico. 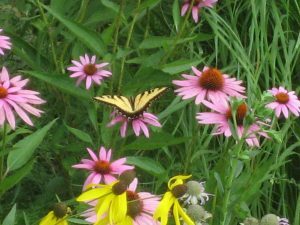 Eastern Tiger Swallowtail on Purple Coneflower (Echinacea purpurea). Native coneflowers make the perfect landing platform for pollinators. the pollinator to benefit from the food resources it gathers as it travels from one plant to another to enable maximum nutrition. The US Forest Service has put together a table of pollinator syndromes to help identify the potential plants with which pollinators may associate. This helpful chart will assist you in learning which flower traits attract different types of pollinators. See also Pollinator Syndromes by Pollinator Partnership. You’ve probably read the peak bloom time for the cherry trees* in Washington DC is now approximately five days earlier than their first recorded date in 1921. This seems to be a trend everywhere in the USA and is likely the result of climate change. Plants, trees and shrubs are blooming earlier because of milder winters and earlier spring thaws. These changes in climate, in conjunction with the longer falls, have increased the growing season in the 48 contiguous states by almost two weeks. 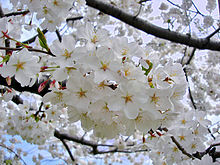 *The trees were given to the city of Washington DC as a gift of friendship from Japan in 1912. 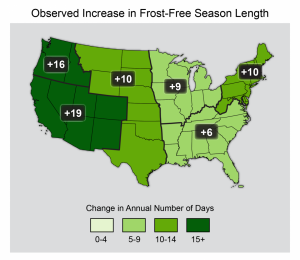 Increases in frost-free season length correspond to similar increases in growing season length. This graph illustrates how the frost-free season length has increased in each US region from 1991-2012 relative to 1901-1960. A frost-free season length is defined as the period between the last occurrence of 32°F in the spring and the first occurrence of 32°F in the fall. Graph courtesy of EPA. These changes affect entire ecosystems. They produce earlier and longer fire seasons. They affect the local economy. They also can disrupt tourism like they’re seeing in Washington DC right now.